We will make spectacular hikes while enjoying the wonderful surroundings and exploring the local culture in different regions. We will stay overnight with some Albanian families in the Albanian Alps, taste delicious traditional dishes, visit historical city centers and pass through picturesque villages along the Ionian coast. In short, an experience you don’t want to miss! The first week we will discover the coastal south of Albania in a balanced mix of hikes, cultural visits and relaxation. Travelling from the Adriatic to the Ionian coast, marvel at the splendor of the Llogora Pass, white gravel beaches, and the picturesque villages of the Riviera. The tour then proceeds to explore a succession of archaeological sites and the historically significant towns of Butrint, Gjirokastër and Berat. 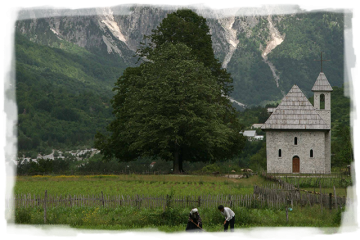 The second week, we will travel to the rural areas in Northern Albania, where you can enjoy walking through incredible mountainous landscapes with charming valleys, and experience the traditional hospitality of local Albanians in the guesthouses where you will stay overnight. 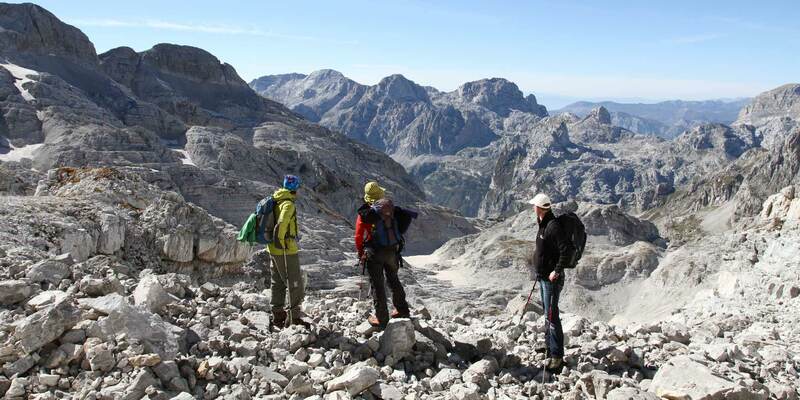 We will explore some of the most scenic parts of Albania and enjoy a ferry trip on the spectacular Lake Koman, a trek through the beautiful Valbona Valley and a visit to the Valley of Thethi. We will visit the ancient Fortress of Kruja and admire the spectacular view of one of the largest lakes in Europe from the ruins of the Rozafa Castle in Shkoder. Check in to your hotel in Tirana you will meet the guide at the agreed time, and go over the program for the coming week. Later, a walking tour through the city’s landmarks like Scanderbeg Square, the Clock Tower, the Mosque of Et’hem Bej and more will follow. Enjoy dinner in a restaurant in town, and then return to the hotel for the night. Today we will drive south towards the coastal city of Vlora and the national park Llogora. On the way, we will visit the ancient ruins of Apollonia, its Byzantine Monastery and (if you wish) the Museum of Archaeology. We will have lunch under the shade of the trees in one of the restaurants of the Apollonia Park. Before we drive to our hotel in Llogora Park (750m), we will have a short stop in the bay of Vlora to have a refreshment in a panoramic location. The surroundings of Llogora Park have been described as one of the most dramatic mountain and sea panoramas of the Mediterranean. It is here that our first hike will take place. 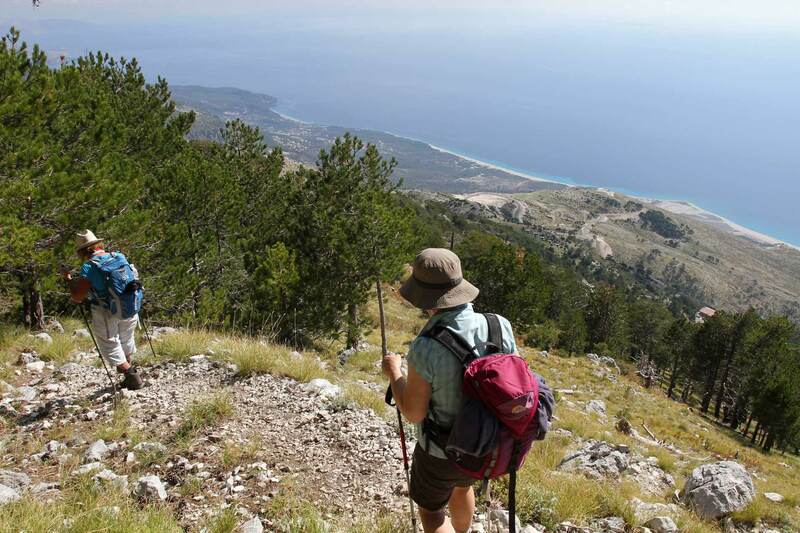 We will make our way up towards Qafa e Thelle (1200m) – The Deep Pass – through dense mixed forest the steep western slopes of the Karabruni penisula, dropping down towards the waters of the Ionian Sea. In the afternoon, upon return, we will have an optional walk or the chance to relax in the hotel until it is time for dinner. In the morning, we will hike up to Mount Cika, Qafa e Erës (1600m). The Cika (2045m) mountain is the highest peak of south-western Albania. 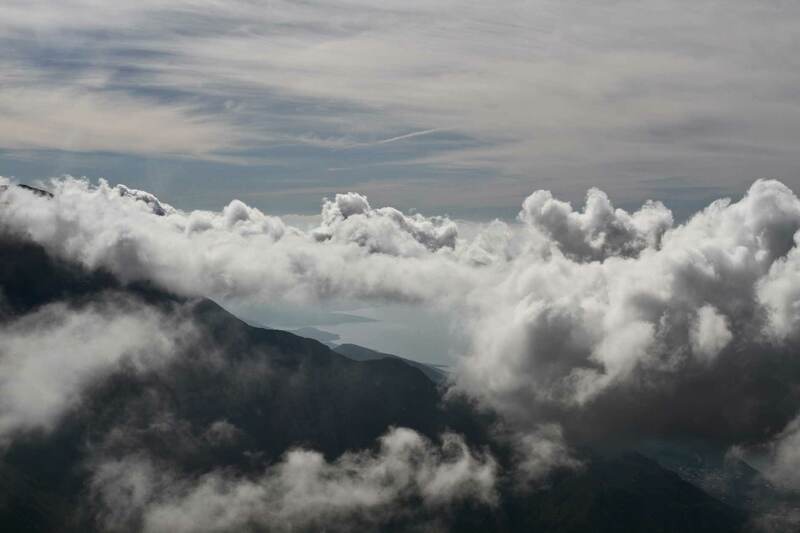 From the summit, you can admire the stunning view of the highlands of “Labëria” – land of southern shepherds – and the splendor of the Ionian Sea with Corfu and other minor Greek islands on the horizon. After the hike, we will drive further along the Ionian coast until we reach the village of Qeparo (0m) at the sea. Before we reach our final destination we will stop to visit the beautiful bay of Porto Palermo and the Ali Pasha Tepelena fortress. The drive will bring us further south along the splendid Albanian Riviera. Saranda it is set in a lovely horseshoe bay, making it a holiday resort since communist times. Nearby, following a panoramic road along the homonymous lagoon are the remains of the ancient Butrint that we are going to visit. “Butrint is undeniably a beautiful place. Close to modern civilization yet with its monuments in thick woodland. With remains dating from so many different periods covering two and a half thousand years.” We will have lunch in a restaurant not far from Butrint. After this we will go to a hotel by the sea where we can relax at the beach or stroll through the city, until it is time for another tasty dinner. We will leave the coast and drive inland towards Gjirokaster – the City of Stone. Here, we will visit the Castle, the Museum of Weapons, the Ethnographic Museum and we will take a walk along the stone paved alleys of the town. Gjirokastër is one of the most beautiful Albanian historic towns, with a citadel dating from the 13th century. Walks along the stone paved streets will bring you to discover the charming traditional Albanian architecture. It was in these gray-toned streets that Enver Hoxha (the notorious Albanian dictator) and Ismail Kadare (the notorious Albanian writer) grew up. At the end of our visits in Gjirokaster, we will drive to our next night-stop: Berat. Berat is the best-preserved historic town of Albania. Illyrian, Roman, Byzantine, Ottoman and Socialist buildings accumulated over 2400 years, and show the importance and the rich history of Berat. We will walk in the characteristics neighborhood “Mangalemi” to visit the Ethnographic museum. Then we will hike up to visit the citadel district of Berat, its splendid orthodox churches and the Onufri Icons museum. In the afternoon, we will drive on to Durres (92km/1hr30min), where we will have a stop for a refreshment by the sea, before we continue on our way back to Tirana. Today you will have the morning free in Tirana, then in the afternoon we will continue our journey to Kruja. 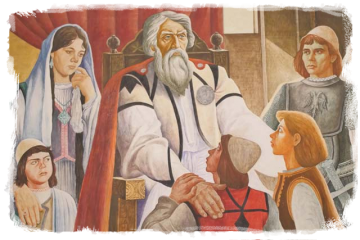 We will visit the Kruja Bazar and the Kruja castle, epicenter of the legendary Albanian resistance against the Ottomans led by national hero Scanderbeg in the 14th century. Today we will hike up the holy mountain of Sarisalltik and visit the Bectasci Teqe (Sufi Dervishes Sanctuary) located at 1100m. Afterwards we will start driving North. At the entrance of Shkoder, the largest city of the North, we will visit the Rozafa Castle and admire the superb view of the lake surrounded by mountains. In the evening, we will relax at the lake and walk through town, until dinner. In the early morning, we will drive to the ferry, which goes through the spectacular canyon of River Drin. The lake was man-made, after the construction of the dam of Koman, in the 1980s. The transfer will continue along the beautiful valley of river Valbona, until reaching the picturesque location of Dunishë (750m) where we will stay overnight. 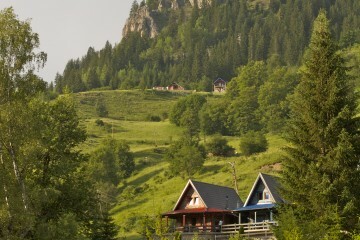 The hike will start from the house in direction of the village of Kukaj (900m). 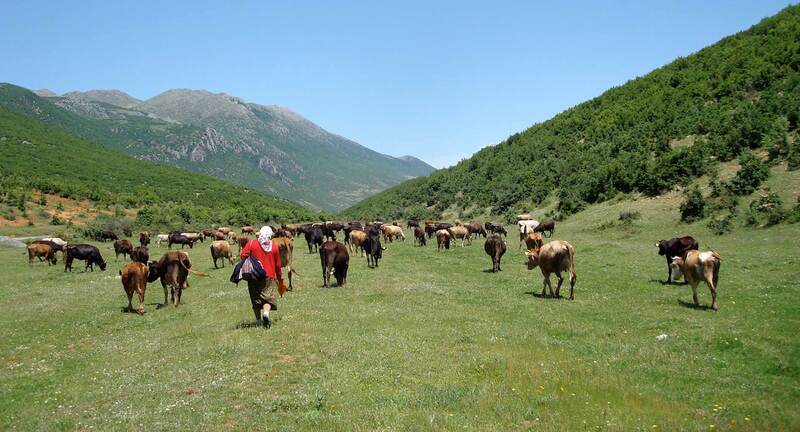 From there, a shepherd’s path will bring us to remote landscapes of the eastern Alps of Albania until reaching Qafa e Rosit (2000m). The path climbs smoothly in the middle of green meadows, with gorgeous views of Jezerca Mountain and Rrethi i Bardhë – The White Circle. At the end of the day, we arrive in the village Rrogam (900), where we will overnight in a mountain hotel. 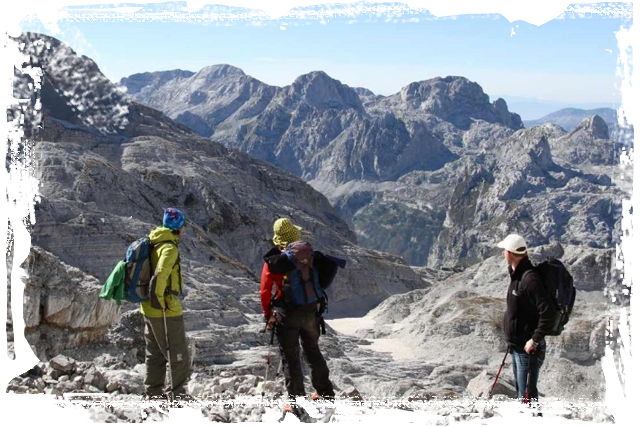 Today we will hike the classic pass of the Albanian Alps which, for centuries, has linked the two most renowned valleys of the area, Valbona (Valbona pass; 1966m a.s.l) and Thethi. We will use mules to carry the luggage to the next house. Several springs of water will make the stops pleasant and refreshing, while admiring the steep and jagged surrounding peaks of Jezerca and Radohima. From there the group will start the descent towards the village of Thethi (850m a.s.l), where we will stay overnight after up to 8 hrs of walking. Thethi is the best-preserved alpine village in Albania. It has typical houses still roofed with wooden tiles and its location is spectacular. We will stay overnight and have dinner in one of these traditional houses and experience the unforgettable hospitality of the place. Today we will have a pleasant day exploring the surroundings of Thethi. We will start walking downhill from the house (850m), and visit the attractions near the village, such as the Church (750m), the Kulla e Ngujimit (a tower house used in the past by men as a shelter against on-going vendetta), the Thethi Waterfall, Grunasi Canyon, and the cyclopean stone walled terraces dating from the late bronze era, recently discovered in 2007. We will leave Thethi (850m a.s.l) to start another day of spectacular trekking toward the village of Boga (900m). 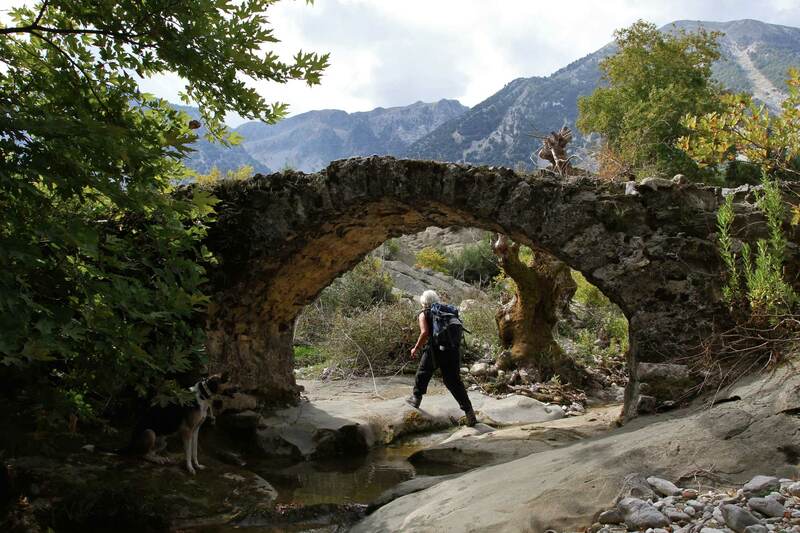 We will walk along Shtegu i Dheneve – the Path of the Sheep – which is another classic path with stunning views of the “Accursed Mountains”, until we reach the village of Boga (900m a.s.l). We will have lunch in this picturesque village surrounded by vertical slopes with peaks above 000m high, and then leave through the Boga valley towards Shkoder and then Tirana (160km – 3hrs).